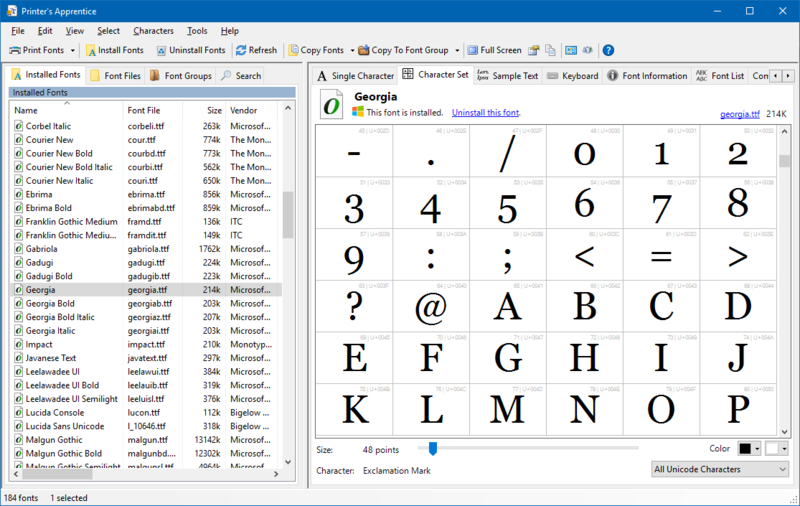 Printer's Apprentice is the powerful and easy to use Windows font manager. Whether you are a graphic artist, a publishing professional or a software enthusiast, Printer's Apprentice will help you manage, organize and print your font collection. The the best way to see if Printer's Apprentice is for you is to take it for a test drive. Printer's Apprentice is free to download and evaluate. This software contains no spyware, adware or any other unpleasant surprises. Printer's Apprentice also very easy to uninstall if you find it does not meet your needs. Printer's Apprentice can be downloaded and evaluated free of charge. If you like Printer's Apprentice and continue to use it, we ask that you purchase a license. Please support independent software developers. We encourage you to download and evaluate Printer's Apprentice free of charge. If you like the software and continue to use Printer's Apprentice, you must purchase a license. It removes the evaluation notices displayed when the application starts. Additional font catalogs and sample sheets are unlocked. The key removes watermarks on printed catalogs and sample sheets. Technical support is provided by the author. An individual license for Printer's Apprentice costs $24.99. A single user may use this software on three (3) computers. Corporate users require a license for each workstation. Multi-copy discounts are available. After purchasing a license, we will email you a license key that will remove evaluation notices and unlock additional functionality. Lost your license key? Use this form to request a new one. Multiple copy discounts are available. Your discount will be calculated automatically when paying with a credit card. If you wish to purchase multiple copies using PayPal, please contact us at helpdesk@loseyourmind.com.